These reprints are from the Sunday pages of the comics from 1949-1953; written by Alvin Schwartz and drawn by Wayne Boring (June 5, 1905-Fedruary 20, 1987). Mr. Boring was my favorite artist; the one I grew up reading. His Superman was barrel chested and every bit the hero. His signature view of Superman in flight was to show him striding through the air toward the viewer. Along with penciling the Sundays he was the chief penciler on the Superman comics in the 1950s. heroes as well. He is also confused with another Alvin Schwartz who made a career out of writing children’s books. 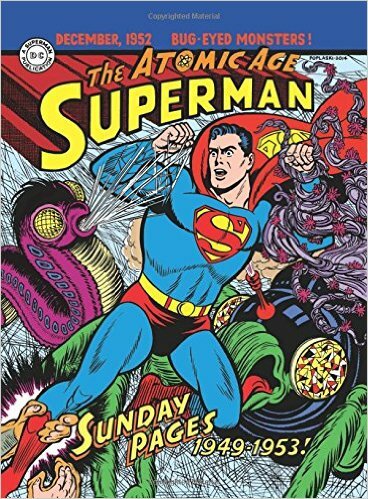 Because the papers where I grew up in New Jersey, were not running Superman in the Sunday Comics therefore had no idea they ever existed until many years later. The stories in this book are fun and somewhat whimsical, but that was the Superman of the first two decades. The writing played fast and loose with the laws of physics at that time. 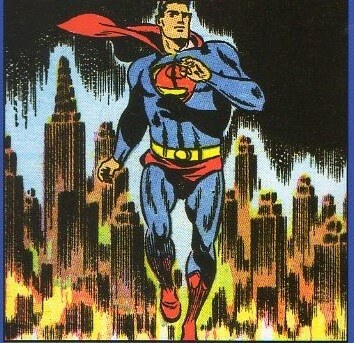 No way Superman could rush all around at super speed and not kick up a whirlwind and not be noticed. Heroes were likeable and approachable back then. Today they are troubled and full of angst. Supposedly to make them more relatable to readers of all ages. These early stories are fun and give the true history of Superman; a return to what his roots were like. He wasn’t the all powerful, God-like interpretation of today but rather an individual who tried to do the right thing even if it made more trouble that he had to get out of. And he usually made some super-sized machines or objects to get the job done. The book is 9 3/4 x 12 1/4 bound in a hardback cover. I got my copy from Amazon, but there are many other outlets where it can be obtained.